Coming on Friday, May 18: Midcoast Maine’s Got Talent! 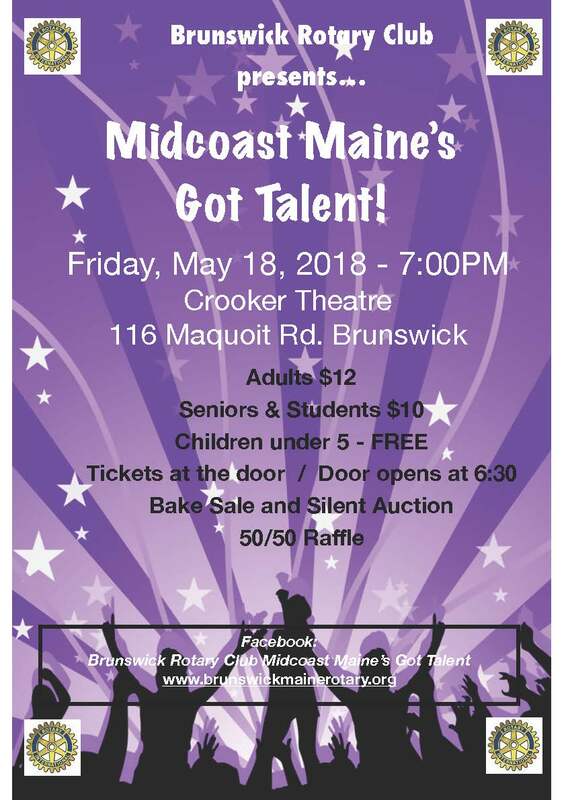 The Rotary Club of Brunswick is happy to announce the 2018 edition of “Midcoast Maine’s Got Talent!” In its seventh year, this fun and well-attended local talent show will be held on Friday, May 18 at 7:00 p.m. at the Crooker Theatre (Brunswick High School) in Brunswick. All ages and all types of talent have been accepted for this year’s show. Unlike previous editions, this show will not be judged but instead will be performed for the sheer joy of performing! A wide variety of acts should keep the audience well entertained. Teresa Gillis is this year’s show director, and Curt Dale Clark, the Artistic Director of Maine State Music Theater (MSMT), will serve as emcee for the event. Interns from MSMT will perform the opening act. Twelve-year old vocalist Juliet Frizzle from Brunswick, last year’s winner, will return this year with an original song. All performers will participate in the closing act. Tickets will be available at the door; doors will open at 6:30 p.m. Tickets are $12 for adults, $10 for seniors and students, and children under 5 are free. Baked goods will be available for sale in the lobby. Additionally, there will be a silent auction and a 50/50 raffle at the event. Proceeds benefit hundreds of area youth and families through the Brunswick Rotary Club Community Fund. The Brunswick Rotary participates in many local and international service projects in addition to provide financial support to non-profit organizations that serve our community. In previous years, charitable contributions have been provided to the Brunswick Teen Center, People Plus, the Swinging Bridge Fund, Mid Coast Hunger Prevention Program, the Independence Association and various youth sports programs. This event also helps to provide funding for two annual events, the Bike Rodeo in May and Games on the Mall during Brunswick’s Fourth of July celebration.